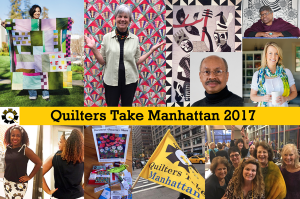 Quilters Take Manhattan is the Quilt Alliance’s annual fundraising event held at the Fashion Institute of Technology (FIT) in the heart of the Garment District in New York City. Every September since 2011, quilt world stars like Marianne Fons, Denyse Schmidt, Jennifer Chiaverini, Hollis Chatelain, Amy Butler, Ricky Tims and Kaffe Fassett have shared their stories at our annual QTM event to support our cause of documenting, preserving and sharing the history of quilts and their makers. Live QSOS and Go Tell It! interviews have added a fun and sometimes emotional element to our annual QTM event. Here are recordings of Marianne Fons and Mark Lipinski from last year’s QTM. And don’t forget, if you plan to attend this year’s QTM (September 15-17) featuring speakers Sherri Lynn Wood, Merikay Waldvogel, and a QSOS interview with Michael E. Cummings conducted by Dr. Carolyn L. Mazloomi, get your tickets soon. We expect to sell out! For more information and tickets, visit our website here.